Finding the best compound bow among tons of models available on the marketplace is a difficult task. Understanding the psychology of customers, we gladly recommend one of the best purchasing compound bow options. This is SAS Siege 55lb Compound Bow. The model is highly appreciated by perfect combination between design and feature. It deserves to rank 4.5 out of 5 stars for its remarkable contribution to human life. Our review focuses on demonstrating both strengths and weaknesses of the bow in a comprehensive way. Keep on reading and decide whether the tool is suitable for you or not. The bow makes impressive by the sleek and compact design of just only 4 pounds. As a result, it provides a great ease of carrying and storing this tool for outdoor activities such as hunting and practicing. However, don’t make a mistake that the model is less efficient. In fact, it offers remarkable strength that people should take admirable eyes looking at this device. Using this tool means you have chance to select various draw weight options from 40 to 55 pounds. This is excellent for serving hunting task. Other statistics can be listed here include 29’’ of draw weight and 41.5” from axle to axle. They are quite impressive! Siege attempts to offer a full package of fabulous features including one compound bow, one accurate sight and one paper target. There is no additional tool required for the bow establishment. Therefore, it takes you 10 to 15 minutes to complete all necessary steps. Let’s see this modern compound bow in details. 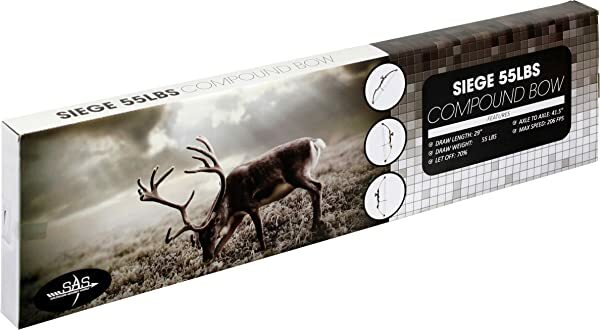 One fact is that SAS Siege 55lb Compound Bow includes a great number of fabulous features inside of the box. We ensure that it is a right investment for long-term goals. Power is the most important factor when looking at this product type. The bow comes with long draw weight up to 55 pounds, 70% of the let off rate and impressive 206 feet per second. Combining well with the huge improvement in back pivot limb, it effectively boosts the level of high accuracy. Besides, most of people feel satisfied with decent accuracy level of the bow. As you know, it is easy to stretch the string for suitable force on your targets. Coming with less vibration and great balance between weight and strength, the bow is an out-standing option for hunting from different distances. A great benefit of the tool is that it meets the needs and demands of all customer types well. Even you are masculine man or weaker one, this bow is completely for you thanks to excellent power and the great ease of use. Quickly order it now and discover all of its gorgeous characteristics. Talking about the high durability of using this model, all of its parts are covered by high-quality materials. It also equips ABS limb technology which allows you to take advantage for years. How wonderful it is! There are several important things you had better bare into your mind before purchasing a compound bow. It is advisable for you to match your purposes and product specifications together. Moreover, reading previous compound bow reviews helps bring a comprehensive eye to you. In general, purchasing a product means you are engaged into a big investment. An efficient item will bring a variety of positive advantages and vice versa. The SAS Siege 55lb Compound Bow is an out-standing recommendation for people who look for the affordable price and effective features. For the entry level of practicing, you should take this machine into your first priorities.